The human race has a macabre fascination with disasters, so your students are sure to want to read this Minute. Author Whiting tells us that the Titanic’s sinking led to a “massive overhaul of [safety] regulations.” This is a fairly common historical pattern. Have your students investigate other situations that prompt legislation. What are the benefits and consequences from additional regulations? What do legislators have to balance when they are considering passing safety regulations on any industry? How do they make those kinds of decisions? How would your students decide? What exactly is an iceberg? How are they formed, and what kind of ecosystems exist on them? Can anything live on these enormous chunks of ice? What happens if they melt? Are they composed of fresh or saltwater? Are they worth studying, and if the answer is yes, how exactly might one do that? Get your kids ready to brave the study of the mighty iceberg - How Stuff Works has some great extension ideas and a podcast about icebergs. Titanic weighed more than 40,000 tons or more than 80 million tons! Why did it float at all? Use this Minute to teach students about water displacement, density, weight and volume. Find some good experiments for your students to try so they can come up with some good rules of buoyancy. Get a big bowl, fill it with water, and start experimenting! What sinks and what floats? Try unpeeled citrus, then peeled citrus. Try all kinds of objects and then have students draw some conclusions from their observations. 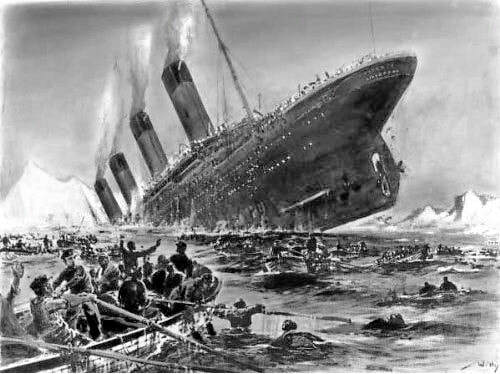 We know that the Titanic did not have nearly enough lifeboats for the passengers aboard. What kind of things should anyone who takes to the sea think about? What are the legal and logical safety steps that all boat riders should consider before heading out?